In just a few short days, the ‘Easter Bunny’ will hop all over the world delivering chocolate, eggs and toys to kids and adults around the world. Ok, so we all know it isn’t really the Easter Bunny, but we still love to pretend it is. After all, that’s what makes these holidays so much fun. Personally, we look forward to chocolate bunnies the most in our Easter Basket. Which, according to statistics, are one of the most popular food items to receive on Easter. In fact, 70% of the candy purchased for Easter is in the form of Chocolate. While the getting candy part of Easter is fun, the most important part is spending it with the ones you love. We put together some quick tips to ensure you enjoy a safe and fun Easter with your elderly loved one. With all the excitement, it may be exhausting for your elderly loved one. Make sure you plan your meal and festivities around their normal eating schedule. In addition, if they feel exhausted find a nice, quiet area for them to relax and possibly nap in. It’s a holiday, calories and junk food don’t count, right? Wrong. It’s ok to splurge a little, but you will want to make sure there are healthy items on your menu that your elderly loved one typically eats. In addition, make sure you follow any dietary restrictions your elderly loved one may have. If there are a lot of people at your Easter Celebration, assign someone your elderly loved one is comfortable with to be their companion for the event. Often, big events can be overwhelming for loved ones if they don’t know many people. Having a companion to spend the event with and talk to will ease any anxiety they may be feeling. It’s important to be aware of things your loved one may need such as a bathroom break, nap, a more comfortable chair, something to drink, fresh air. Whatever it may be, staying on top of your loved one’s needs will ensure a safe and fun Easter celebration. With all the rich food, staying hydrated throughout the day is an important key to a safe Easter celebration. We suggest keeping a bottle of water in an easily accessible location for them such as a hand bag. If you are hosting your loved one for the Easter celebration, keep their safety and comfort in mind. Pick up clutter that might make them fall and fix any rugs that could increase the risk of a slip and fall. If your elderly loved one can, a good walk after a large Easter dinner will help the food settle and be a nice break. 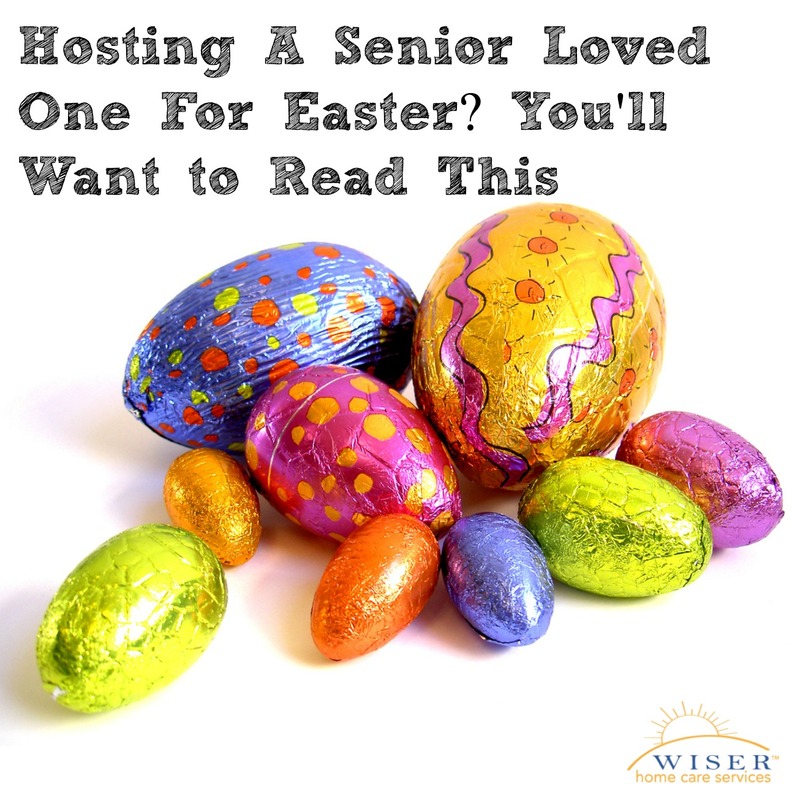 As always, Wiser Home Care is here to help you with whatever you need, even your Easter Celebration. From providing care to developing an extensive care plan for your loved one, and everything in between, we are happy to help. Please contact us, and we will be happy to answer any questions you may have.